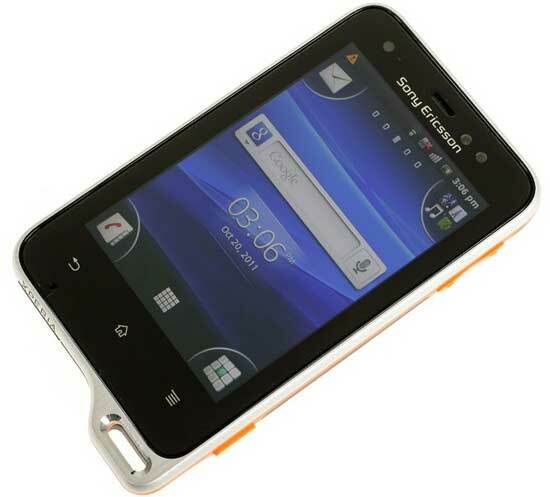 The Sony Ericsson XPERIA Active is water, dust and scratch resistant Android Phone. It runs Android 2.3 Gingerbread now buy Sony already confirms us a ICS upgrade is coming in May/June 2012. The handset sports a 3-inch Capacitive touchscreen display, a 5MP camera with digital zoom for HD video recording and playback, FM Radio, 512MB RAM, 320MB internal memory and up to 32GB external memory support to store your favorite multimedia stuff. The phone kit includes a stereo headset with attachable ear hooks and an arm case and wrist strap to keep your phone close. There’s also a Micro USB cable for managing your media and a 2GB memory card for all your entertainment. Whether you’re calling a taxi in the rain or calling a friend poolside, the touch screen is fully functioning even when your fingers are wet. Mud battered bike rides, dusty trails or an accidental meeting with a puddle. You phone can handle any conditions in any weather. This awesome rugged Android smartphone is now on sale in Bangladesh. Price of the unlocked handset is around 25000 Bangladeshi Taka($307). But due to USD to BDT rate fluctuation the price might change a bit. You can buy it from Bashundhara City level one mobile stores without any warranty. XPERIA Active is also available in Amazon. Unlocked price is only $365 for now. If you are interested then don’t be late.